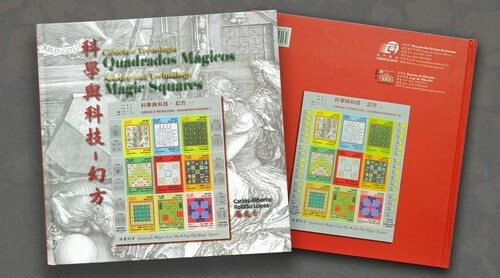 The interest for Magic Squares is transversal in Chinese and Western Cultures. For this reason, a Philatelic Book “Science and Technology – Magic Squares” will be issued by Macao Post on6th October, 2016. Macao Post intends not only to promote this theme in scientific and cultural terms, but to also create a unique product in the history of Philately. This Philatelic Book consists of 2 stamp issues, which includes: “Science and Technology – Magic Squares I” issued on 9th October, 2014 and “Science and Technology – Magic Squares II” issued on 12th November, 2015. The price for this Philatelic Book is MOP250.00 and is available for sale at the Philatelic Shop of Macao Post Headquarters, Rua do Campo Post Office, Maritime Ferry Terminal Post Office, Airport Post Office and the Communications Museum.